Thank you to everyone who stopped by our booth at the Architectural Digest Design Show last week. We were flattered to see how many of you were excited about our newest designs. For those who couldn't make it, or for those who need a refresher, here are the sconces, pendants, and chandeliers we had on display. 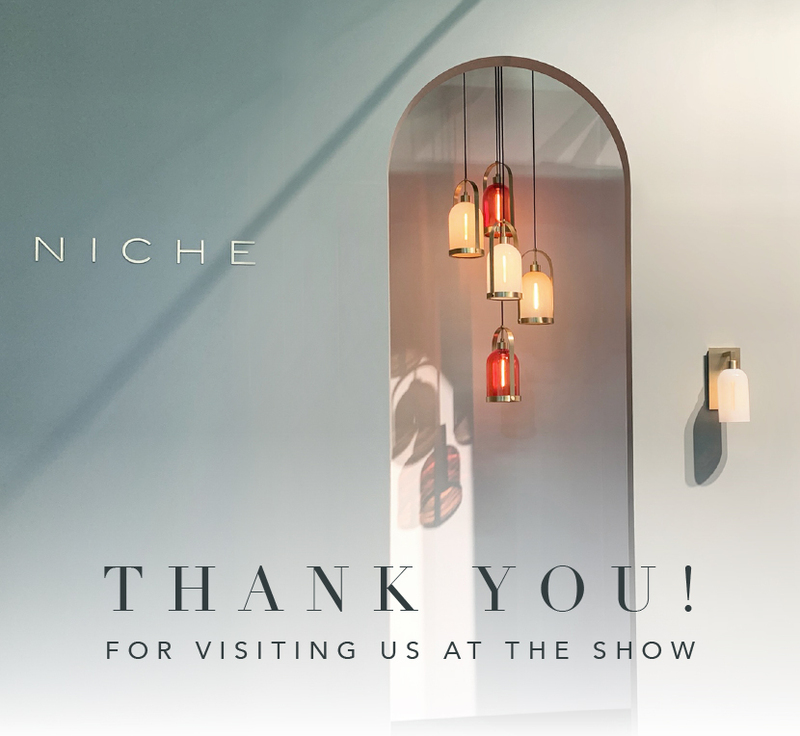 Niche debuted their first-ever sconce collection at the Architectural Digest Design Show last spring. This year, we are pleased to add two new silhouettes to the mix: the Chinois Sconce and the Cloche Sconce. Display one of these hand-crafted pieces, which cast beautiful shadows of light on the wall, from a high-quality Satin Brass or Polished Nickel mount. This bell-shaped pendant finds inspiration from the delicate glass covering used to protect that which is on display. Surrounded by a metal frame, the Cloche light draws attention to the warm amber glow of the vintage-style filament bulb presented inside. 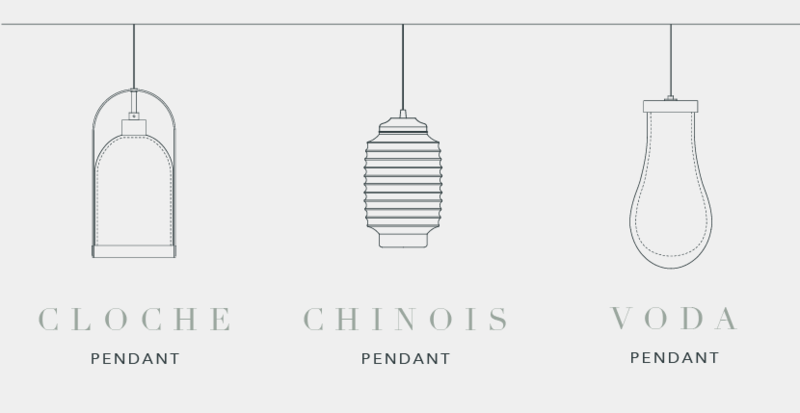 Influenced by Chinese paper lanterns, the Chinois pendant features ribbed layers that help to disperse light. Illuminated by a discreat LED system, these culturally-inspired pendants create a stunning display when clustered together. Inspired by one of nature's four elements, the Voda pendant takes the shape of a water droplet. Like the Chinois pendant, it is also illuminated by a discreat LED system. The Marquise Quill Chandelier features four hand-blown glass shades. The rigid arms of the chandelier, which are available in Satin Brass and Polished Nickel, complement the elongated body of the Marquise glass. 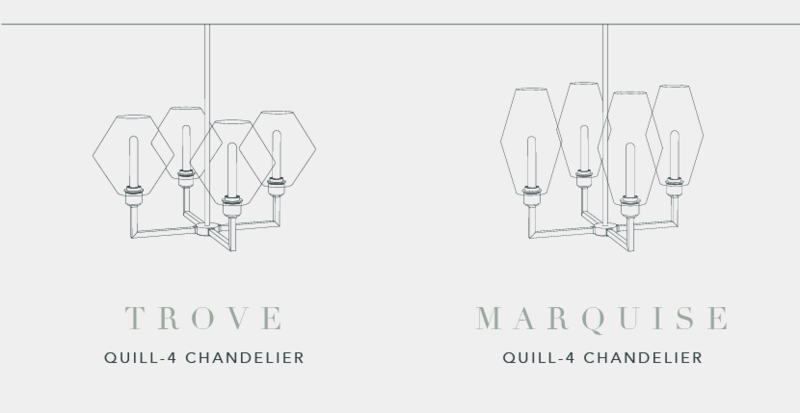 The Trove Quil Chandelier features four hand-blown glass shades from our Crystalline Series. The angular frame of the Quill Chandelier pairs perfectly with the defined edges of the Trove glass. Choose your desired height and metal finish to create a truly unique lighting display.